Montchanin Builders is pleased to announce the opening of The Overlook at Rockford Falls, our new, exclusive, one-of-a-kind community nestled on the peaceful, picturesque banks of Brandywine Creek. You are invited to schedule an appointment to view the floor plans and features of our spacious, amenity-filled homes. The first two homesites in The Overlook at Rockford Falls are now under construction, so call today for a site tour! 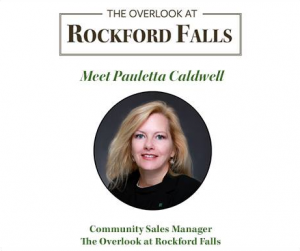 In related news, we are overjoyed to welcome Pauletta Caldwell as our Community Sales Manager for The Overlook at Rockford Falls. To schedule a tour or for more information about our luxurious, exclusive community of 32 townhomes in Rockford Park, on the historic Bancroft Mills site, please contact Pauletta at pcaldwell@montchaninbuilders.net or 610-454-8009. 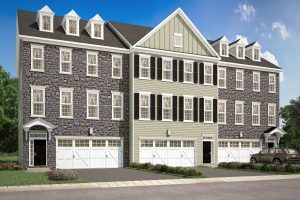 The masterfully-designed townhomes at The Overlook at Rockford Falls feature beautiful stone exteriors with a 2-car garage. The interior is a spacious with up to 4,000-square-feet of living space with three bedrooms, two and one half-bathrooms. Owners have the choice of features, such as an elevator, a finished recreation room, fourth bedroom and bath as well as outdoor entertaining areas. Perfect for growing families, retirees, and first-time homeowners, this community is situated on preserved state park land, amidst lush woodland with walking and hiking trails, and access to the historic Rockford Tower landmark. Rockford Falls is nestled within Bancroft Mills, a mill complex in Wilmington and a focal point in Delaware history. Its origins go back to 1831, when the site was converted into a cotton finishing mill by English immigrant John Bancroft. The mill became the biggest of its kind in the United States. A century later in 1930, the mill stood as the largest in the world. It’s not just the house that makes up your home. The surrounding community is just as much a selling point for home buyers. Much of the site’s historic appeal still remains, giving residents and visitors a glimpse of the past that remains frozen in time. Enjoy access to numerous recreational activities, including walking trails and serene waterfront views. Walking distance to the Delaware Art Museum and Delaware State Parkland, located just 1.5 miles from downtown Wilmington. Residents also enjoy access to Rockford Park, erected in 1889 and standing as one of the oldest parks in the city. This provides a tranquil backdrop for picnics and walks with the family dog. Within Rockford Park lies Rockford Tower, an iconic century-old landmark. Make it to the top, and you’ll be rewarded with a magnificent bird’s eye view of the entire area. Call Montchanin Builders today to schedule an appointment to visit our new Design Center, and see for yourself why The Overlook at Rockford Falls is a reflection of its rich history. Be sure to sign up to be on our VIP list to be one of the first to learn about prices, plans, and invites to our upcoming preview events.